We have previously shared with you some wedding traditions we usually see on wedding ceremonies. These traditions usually came from one or both of the couple going to be wed. Upon reading some articles regarding another wedding tradition being out of fashion, we wanted to write something about it since we are on that subject. We are talking about wedding rings. Wedding rings is an essential part of the wedding ceremony. Wedding rings can be made of gold, silver or platinum metal and indicates that the wearer is married. It is usually worn on the fourth finger of the left or right hand depending on local culture. Exchanging of wedding rings has been recorded from Ancient Egypt about 4800 years ago. Before metal was used, sedges together with rushes, reeds and papyrus were the first known wedding bands. Even before, circle was used as bonds as it symbolizes eternity. When wedding rings have been adapted by other cultures, it was first used to brand women and show ownership of them. Which is why, only women only wore rings. It was around the 860s, when wedding rings has been used in marriage ceremonies. Different factors are added to the wearing of the rings until it was now worn by both the wedding couple. Wearing of the wedding ring may be done in 3 ways. The traditional way is to wear it on the 4th finger of the left or right hand. For women, they usually wear it together with their engagement ring. While for some, they tie the ring on their necklace. Regardless of how they are worn, wedding rings symbolize the unity of the two persons who wed and exchange vows. And we sure hope it will not go out of fashion. If you missed it, you can also read up on our last article about choosing a wedding ring. Traditionally presented as the final gift from the groom to his intended, the wedding ring is a symbol of commitment and never ending love. There are now many styles of wedding ring, some simple and some ornate – the choice can be overwhelming. With this ring I thee wed….. When choosing your ring it is understandable that you may be swayed by the design but it’s important to remember that you will be wearing it every day, forever after. A wedding ring which is a good fit and comfortable to wear should be the foremost consideration and the design very much secondary. This doesn’t mean you have to play safe with a plain band, there are many elegant but subtle designs available which provide the opportunity to make a statement without being uncomfortable to wear. 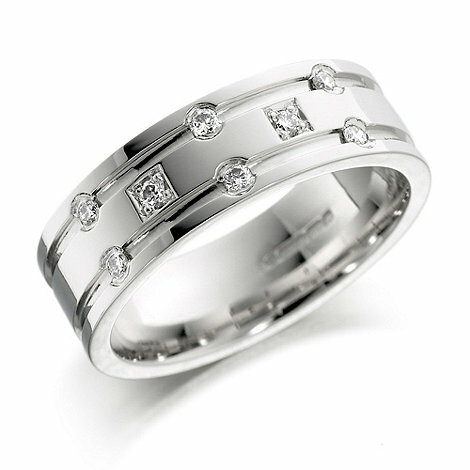 Diamond Set – A diamond set wedding ring can come in all shapes but is set with diamonds for added glamour. There are obvious advantages and disadvantages in both cases although it’s likely that you will get better value for money when buying on-line. The biggest reason why people prefer to buy their ring from a traditional store is the option to try various styles without the hassle of having to send things back and wait for a replacement. While this is true, to an extent, you have the advantage when buying on-line that you can take your time without a shop assistant pressuring you. Also, many of the leading internet jewellers offer a fair and simple return policy so you don’t have to worry about getting a refund if you change your mind or need to exchange sizes or styles. If you are trying to save money on your wedding day there are certain things you may be willing to sacrifice, such as free alcohol for wedding guests and there are things you can compromise on such as flower arrangements, but some things you really don’t want to scrimp on and your wedding rings are one those things. Your wedding ring is a symbol of eternal love for each other and it’s something you would wear day in and day out. For a piece of jewellery that you have to look at every day, that will always be a part of you; you really don’t want to start cutting corners and end up wearing a piece of tat that would look more at home inside a Christmas cracker. 18ct gold wedding rings contain 75% of pure gold and the rest of the metal is copper and silver. These rings are noticeably yellower in colour as an attestation to the larger amounts of pure gold they contain. It is hardly surprising therefore, that 18ct gold rings are much more expensive and prices can run into thousands of pounds. However it is still possible to get an 18ct gold wedding ring on a budget as very often, with jewellery as well as with clothes, you are paying for the brand as well as the material. So long as you don’t expect a Tiffany’s piece you should still be able to get an 18ct wedding ring for under £500 and at that price, such a piece of high gold content jewellery is not going to detract much in price. Yet you don’t have to splash out on thousands to get something of real quality either. 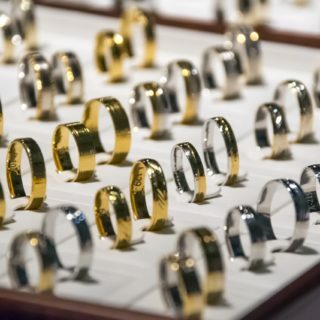 The lower end of the market offers 9ct gold wedding rings which are cheaper than their 18ct counterparts because they are made with less pure gold. Whilst it is true that this makes the 9ct rings harder than the 18ct version, the difference is so slight as to be hardly noticeable therefore it makes little practical difference. 9ct gold rings contain 37.5% of gold and the rest is usually made up of copper zinc and silver with some slight variations. The colour of 9ct wedding rings tends to be whiter than 18ct as the colour hue will come from some of the other metals that make up the ring. Don’t compromise on the most important piece of jewelery you may ever buy; top quality gold should last a lifetime and with any luck you’ll be able to pass your wedding rings onto your children. With a little savvy shopping and an eye for a bargain you’ll be starting your married life with a stunning ring on your finger that will sparkle all the more for the huge savings you made on it!